I try to offer my clients every effective leadership skill, tool, and approach I can. I work to stay abreast of best practices and to continuously learn and improve, so that I can support my clients to continuously learn and improve. But there is one best practice I find myself hesitating to advocate. Sometimes I even have to take a deep breath and convince myself to plunge in and recommend it. Somehow meditation seems to have a bad rep. Maybe it’s too hooey. Too spiritual. Too Eastern. Clients get concerned that I’m going to have them sitting in a lotus position on the top of a mountain staring at their navel, while the world, and their business, passes them by. Or maybe I’m concerned that they’ll be concerned about this. The truth is meditation is a leadership best practice. As shared by Raja Rajamannar, the Chief Marketing Officer for MasterCard, in this great FastCompany.com post, effective leaders don’t just look out at the world around them to better address challenges and opportunities, they also look into the world inside of them to gain clarity, insight, creativity, and energy. Especially in this 24/7 world, which sometimes feels like a 28/10 world, we need a chance to slow down or stop. When we’re on overdrive, there’s often no room for new ideas. When I’m on overdrive I seem to even lose some of my humanity – I don’t want to make an effort for others. I don’t have the space or the time or the energy. But when we do make space, we have more to give. I don’t know about you, but when I give myself space I can feel my imagination sparkle and my zest for life – and the people in my life – grow. I have more patience, more stamina, and more resourceful ideas. What exactly is meditation? There’s a basic lack of understanding of what it means, and what it takes, to meditate. How do you do it? My clients want a few simple guidelines to follow. They don’t want one more big task on their to-do list. They don’t need one more thing they have to get done. What I’ve learned, and I’ve learned to share with others, is that meditation doesn’t have to be a big deal. I’m sure you get the best brain results when you can meditate at least 30 minutes every day. But even just sitting quietly for ten minutes – or even five when you’re just starting out – can help. Personally I have “quiet time” with a cup of tea nearly every morning. Some wouldn’t count that as meditation maybe, but when I really do quiet my mind and pay attention only to my breath, or I’m actively feeling present where I am, that twenty minutes or so gives me space and a sense of peace. I also like to gift myself 15-20 minutes with a guided meditation whenever I can. Two great resources are the Deepak Chopra/Oprah Winfrey series, or Tara Brach. There are a multitude of downloadable apps that offer numerous ways to meditate, some structured, some not. What I’ve also learned is to combat the critical voice inside my head that suggests that I’m wasting time with my meditation. I remind that voice, and myself, that it is a best practice to sit in quiet – for leadership and for life. 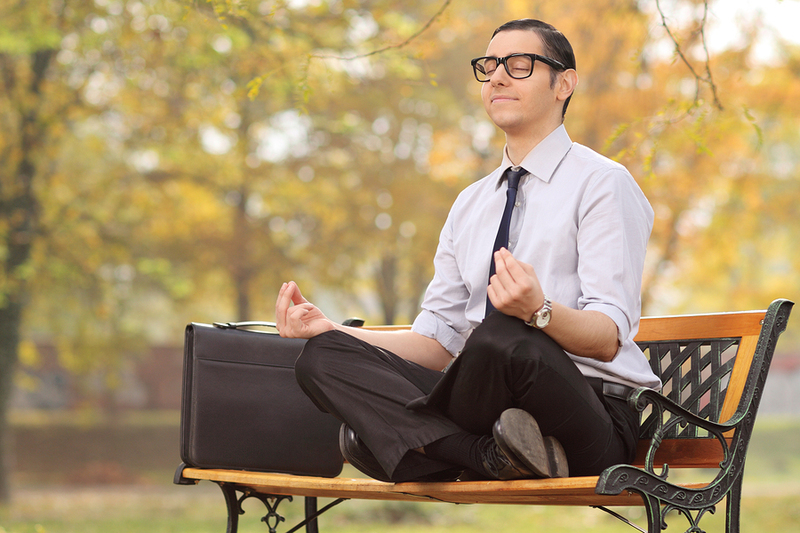 I think that meditation should no longer be a bad word in the business world. If the CMO of MasterCard thinks it’s worthwhile to mediate, maybe we all should give ourselves permission to practice as well. I’m going to offer this best practice more and more to clients, and allow myself more and more to take the space. Right after I quietly sit for a few more minutes. How do you take your quiet time? How can you take more? For support in meditating – or just creating more space – contact Lisa at lkohn@chatsworthconsulting.com.